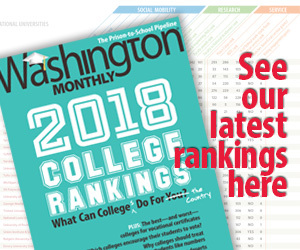 The the U.S. Department of Education’s recent release of a trove of information about campus outcomes was in general something the Washington Monthly very much supported. Information about what happens to college graduates, of all sorts, is important, because it can help potential students, parents, and even college administrators make better decisions. But that doesn’t mean the information is always used appropriately. In particularly, we’ve also seen a proliferation of weird “quick hit” headlines about colleges about which we should be pretty skeptical. This one is particularly shocking because the 25 colleges include such fancy schools as Macalester College, Lewis & Clark, Sarah Lawrence, Oberlin, and Reed College. What’s going on here? Well, basically, the ranking system here is a mess. It begins well enough. As the article notes, “according to the National Center for Education Statistics, the median salary of full-time workers ages 25 to34 with a bachelor’s degree is $48,500.” And the salary of a mere high school graduate ages 25 to 34 with a mere high school diploma is $30,000. It then presents a lists of (many rather otherwise impressive schools) where there are a whole lot of people earning under $30K a year. Well no, because the raking isn’t comparing the same things. The college salaries in the ranking based on the median salary of graduates 6 years after enrollment, as in, two years after graduation. That $48K figure, in contrast is for people ages 25 to 34. That’s a much higher number than the median 24-year-old earns, since it includes a lot of college graduates who’ve been working for many years. *Note: Only colleges with a Smart Rating of 90 or higher were included in this list. To learn more about our Smart Rating system, click here. When one looks through information about the Smart Rating it’s clear that this is really a measurement of the schools that rate relatively high in terms of selectivity, affordability, career success, and academic repudiation. So this only rates the schools that are already relatively selective and do a good job. They’ve already excluded all of those minimally selective state colleges that most people attend. If they didn’t include this filter the piece would look very different. If the rating included all colleges in the country where the median graduate salary two years after graduation was under $30,000 the list would include most colleges in America. And that’s because a whole hell of a lot of college graduates don’t earn much money right out of college. That doesn’t mean college isn’t “worth it.” Nor does it mean that graduates of these college earn less than high school graduates. There’s nothing about this ranking that really indicates there are any real problems at Reed or Sarah Lawrence.